I know that last time I said I was going to start soldering, but I really wanted to play with the networking capabilities of the ESP8266 first. There’s a bunch of example programs to do web requests, such as BasicHttpClient, HTTPSRequest, WifiClient, StreamHttpClient, etc. I had trouble getting these working because there’s no built in certificate store or TLS validation capabilities. That means you can’t do a “normal” HTTPS request to test services like RequestBin (since they’re HTTPS only). The example programs have you type in the server’s SHA1 thumbprint, but that didn’t seem to work for me. The certs I inspected were SHA256, which I assume is the problem. The problem here is that which (if any) are actually good, useful, or correct for the ESP8266. The first search result in that screenshot is only for the “Arduino Uno Wifi Developer Edition”, for example. Another challenge here is working through all the company branding. The second library listed, “Adafruit MQTT Library”, is ESP8266 compatible and comes with a “simple” example program to get started. However, it’s oriented around the Adafruit IO IoT web service (which is apparently a thing). I did get it to work with the local MQTT broker I’m running here on my PC, but I had to guess if might and try to peel away their extra stuff just to get to the bones. The ESP8266 Github linked to lmroy/pubsubclient, which itself is a fork of knolleary/pubsubclient which seems more up to date. I don’t know why they’re linking to an out of date fork, except that it appears to more easily support “large” messages. The original has a default max packet size of 128 bytes, which might be too small for real apps, but I’m looking for a simple example so it should be fine. 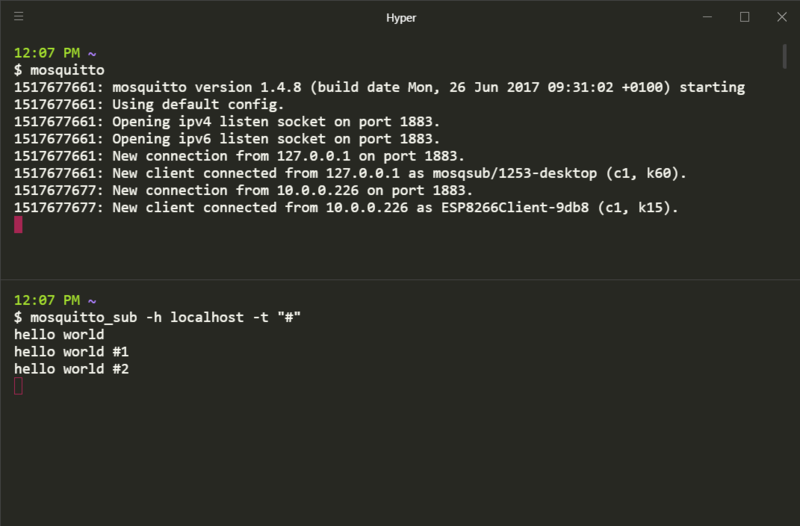 The example is easy to set up; just punch in your Wifi access info & MQTT broker host name. Interestingly it does apparently support DNS… from working with the HTTP examples earlier, some of them used IP addresses rather than host names, so it wasn’t clear if DNS was supported in some of these network libraries. This one does, apparently. Here’s what the output looks like. 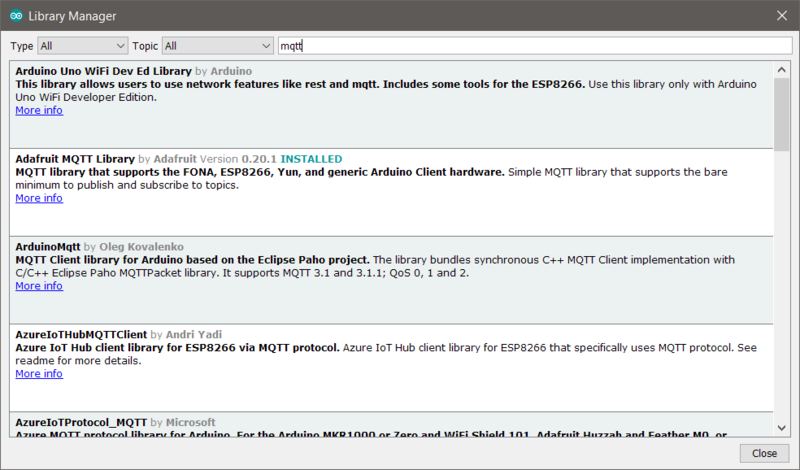 I’m running mosquitto 1.4.8 on my PC, with mosquitto_sub running in the lower panel subscribed to # (a wildcard, so all topic messages are shown). I thought it would be fun to give the messages a little personality, so I found a list of all the voice lines from the turrets in Portal 2, copied them into a giant array, and now instead of “Hello World #37″ it’ll send something like “So what am I, uh, supposed to do here?” or “Well, I tried. Best of Luck!” once every few seconds. Additionally, I made it so that the power LED blinks as it’s sending a message, as a little visual chirp to let you know it’s alive. The code is here, and this version is a modification of the Adafruit MQTT example, rather than the other library linked above, because I wrote it before I discovered that simpler example. (Found the list of voice lines here, and removed a few dupes). This entry was posted in esp8266 on February 3, 2018 by Factor Mystic. I thought it might be fun to play around with programmable microcontrollers, so I bought some to play with. 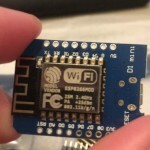 One of the most popular chips right now is the ESP8266 which I first saw pop up on Hack-a-day in 2014. I had to search backwards through 47 pages of blog posts that have been made in the meantime — that might give you a sense of its popularity. I played around with PIC16/PIC18s in the early 2000s but never actually made anything, but the interest has been there. It’s also been my long time desire to create an E-ink weather display (once again thanks to an old Hack-a-day post, this one from 2012. That’s how far behind on projects I am). Recently I noticed some inexpensive E-ink development boards on Aliexpress and decided to jump into a less shallow end of the pool. I had also been following the ESP8266 for Arduino repo on Github, so I vaguely knew where to begin. This evening I received the hardware (specifically, three of these) and decided to see if I could get a basic program deployed, just to get started. I don’t really know what I’m doing but I’m pretty good at reading & following directions (that counts for a lot in life). 1. Follow the “Installing with Boards Manager” directions here: https://github.com/esp8266/Arduino/ (which includes grabbing the latest Arduino IDE software, then pulling in the ESP8266 chip configuration, which includes the WeMos D1 mini board configuration. 2. 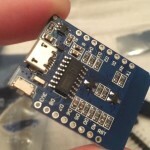 From WeMos’ website, grab the driver for the on-board USB/programmer chip, which for me was the CH240G (https://wiki.wemos.cc/tutorials:get_started:get_started_in_arduino). Nothing more “exciting” than installing Chinese device driver software! 3. I got a little tripped up here, but later figured it out- when you plug one of the D1 boards into your PC via USB, it’ll show up as a COM Port in Device Manager. You have to pick that same COM Port in the Arduino IDE or it can’t find your board to deploy to. This was a little confusing because it won’t show up until you’re plugged in. 4. 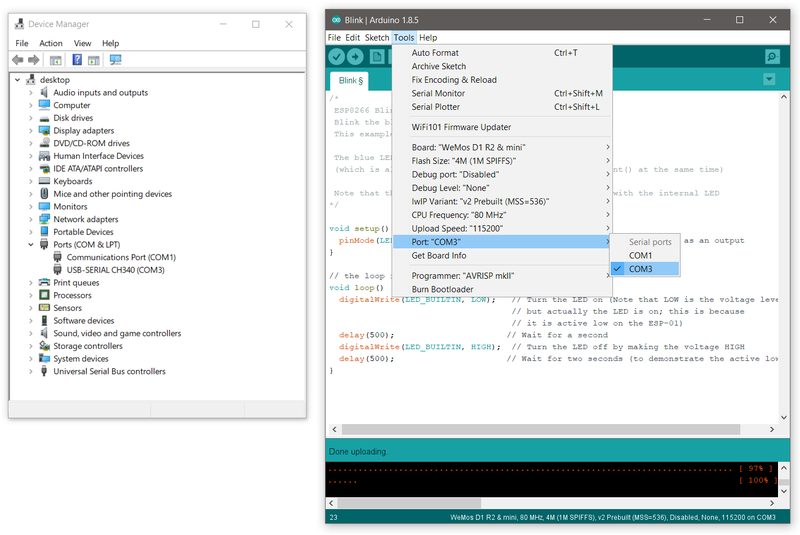 The Arduino IDE comes with the ability to load in example programs from the board configuration, loaded in Step 1. I wanted the simplest possible thing to make sure everything was working, so picked the “Hello World” of microcontroller programs: “Blink”, which toggles the power LED in an infinite loop. So far, so good! All told, this took about an hour from opening the package to getting the light to blink (which includes scrounging around for a good USB cable and trying to get a in-focus pictures). As you can see, I didn’t even bother to solder on the headers yet. I will do that, but I think next I will look into getting some wifi code up and running. This entry was posted in esp8266 on January 29, 2018 by Factor Mystic.